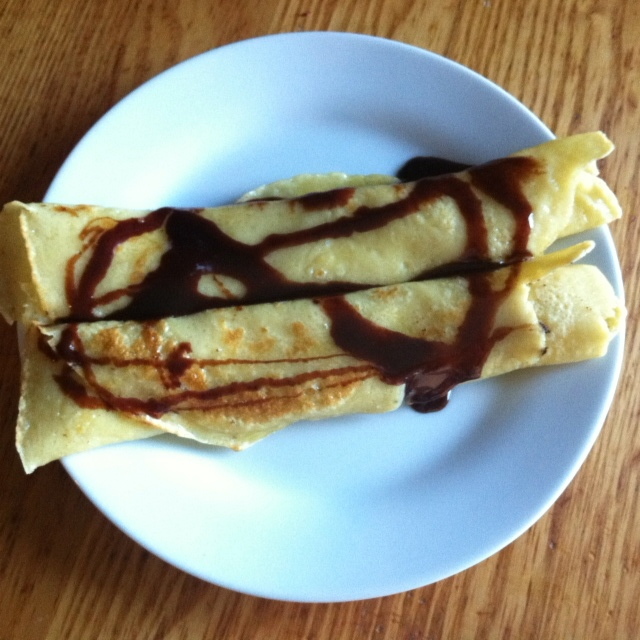 Looking for a basic crepe recipe? Look no further! Last night I decided to go ahead and prepare breakfast for this morning. We had to leave the house early today and I am not a morning person. I usually prepare eggs when I am in a hurry, but I was in the mood for something a little more exciting. So I went ahead and made crepe batter. Here is my recipe. Mix all ingredients together in a medium sized bowl. I like my crepes thin, so I add more milk (keep that in mind). Turn on stove to medium heat and let pan heat up. Put a little oil or butter on pan. After the pan is hot I always turn it back down to low. Pour 1/4 cup batter onto pan and then move the pan around until the batter is thin. Cook for 2 minutes on each side or your preference. My boys like butter and organic chocolate syrup on top. I like bananas, butter, and maple syrup. Very good start today. these crepes look delicious! great way to start the morning.